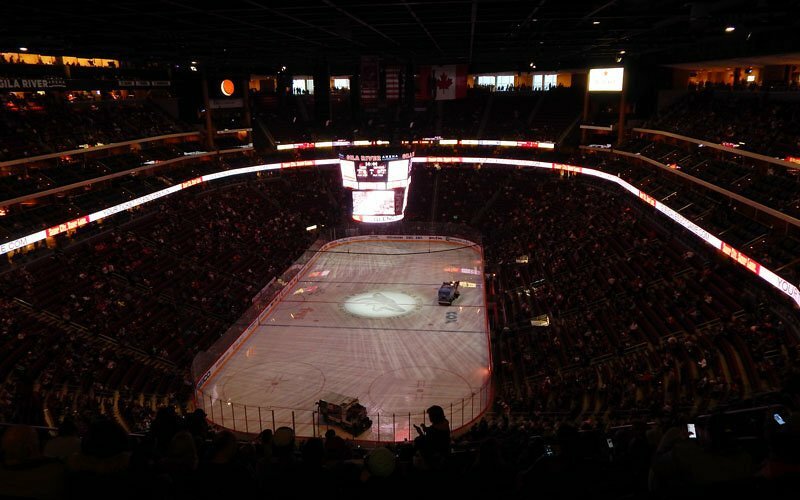 PHOENIX — The Coyotes moved one step closer to finding a new home Friday. In what he called “an update, not an announcement,” team president and CEO Anthony LeBlanc said the Coyotes have chosen a site for their new arena. LeBlanc would not disclose a specific location or timeline for the arena, but said more details would come as the team continues to work through legal documentation for the real estate agreement. “I’ve learned my lesson. We’re not going to put a firm date on it, but we’re now moving forward with the site,” LeBlanc said in a video provided by the Coyotes. The Coyotes have been searching for a new home since June 2015, when the Glendale City Council voted to terminate its 15-year, $225 million deal with the team. The two sides entered into a two-year agreement following that termination, which keeps the team at Gila River Arena through next season. LeBlanc said he expects the Coyotes to stay in Glendale for the next three years while their new arena is under construction. He met with officials from AEG Facilities, which manages Gila River Arena, at the NHL’s Board of Governors meeting last week to discuss a lease extension in Glendale, but said nothing concrete has been put in place as of yet. AEG officials could not be reached for comment. The new building will be funded in a “public-private fashion,” with the Coyotes financing more than 50 percent of the cost, according to LeBlanc. Previously reported possible landing spots for the new building have included Phoenix, Tempe and the Salt River Pima-Maricopa Indian Reservation. Phoenix mayor Greg Stanton has voiced his support for a new shared building downtown with the Phoenix Suns, who are also in the market for a new facility. “Building two new professional arenas in our region simply doesn’t make fiscal or common sense,” Stanton said at his State of the City address in April. The situation surrounding the Coyotes new arena has even found its way into free agency. General manager John Chayka told reporters Thursday that the topic was discussed during negotiations with newly signed defender Alex Goligoski. LeBlanc said that he explained the situation to Goligoski, and that any potential free agents should feel confident about the team’s plans for a future home. A full announcement on the new arena is expected sometime this summer, according to LeBlanc. A backup plan is in place should the current location fall through during legal negotiations, but LeBlanc reiterated the organization’s commitment to the chosen site.